During a heartbeat, a positive wave of electricity (called depolarization) passes through the heart. 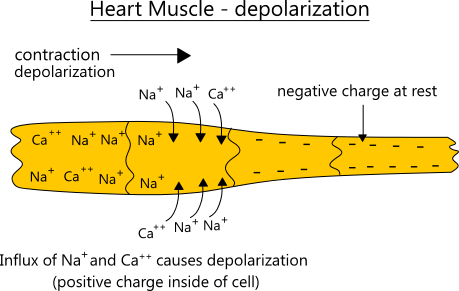 The wave causes positive ions (Na+ and Ca++) to rush into heart muscle cells. The interior of the muscle cell becomes positively charged, and this causes the muscle to contract. 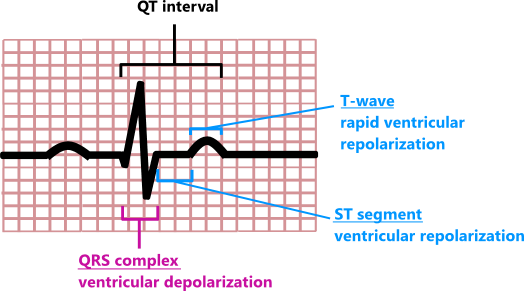 After contraction, the muscle cells must regain their negative charge (called repolarization). 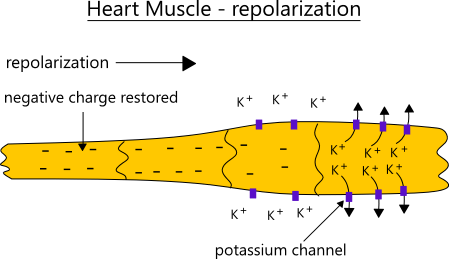 One way they accomplishes this is by opening potassium channels (K+) so that positively-charged potassium ions will leave the cell. The length of the QT interval varies depending on the heart rate. The QT interval is shorter at faster heart rates and longer at slower heart rates.